This ear has the typical appearance of a cauliflower ear. It is thick and irregular. The hematoma has filled the ear up to the rim of the helix and solidified. Plastic surgery was performed to remove the dense scar tissue, and restore the normal topography of the external ear. Cauliflower Ear is a difficult cosmetic deformity caused by a combination of trauma and neglect. Often seen in wrestlers, it is also known as Wrestlers’ Ear. During the injury, the ear skin is pulled away from the cartilage which supports it, causing bleeding under the skin. This collection of blood, known as a hematoma, further lifts the skin off the cartilage giving the typical ballooned appearance. When left untreated, the blood hardens to rock like consistency, making treatment difficult. The best treatment for Cauliflower Ear is prevention. Avoiding injury is always preferable to repairing an injury. Unlike when I wrestled, protective headgear is now available. Headgear can protect the ears from injury. MMA fighters do not wear head gear, and many of them end up with cauliflower ears. The second best treatment for Cauliflower Ear is early surgical intervention. When an ear hematoma is treated early, the outcome is much better. Evacuating the blood from between the skin and the cartilage while it is soft, allows the skin to stick back down where is belongs. Often, a conforming bolster dressing is sewn onto the ear to enforce the approximation. Early treatment not only helps keep the ear looking normal, but also prevents the pressure of the hematoma from causing additional injury to the skin and cartilage. Early intervention for Cauliflower Ear can also be considered prevention. Draining the collection of blood while it is soft, prevents it from organizing and becoming hard. Unfortunately, my patient above, did not seek early treatment. Cauliflower ear is caused by trauma. Like most medical problems, prevention or early intervention are preferable. 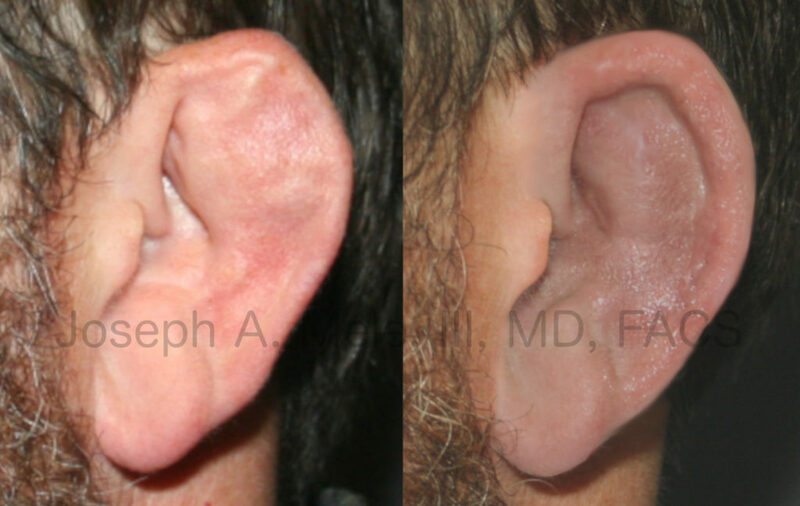 Late treatment, as shown in the Cauliflower Ear Before and After Pictured above, can help; however, creating an aesthetically pleasing ear after this type of trauma is very challenging. Cauliflower Ears are difficult to restore. The process is hampered by distorted anatomy and rock hard scar, which is often calcified like bone. Staged treatment is often necessary and even though improvement is likely, complete correction is not. Delayed surgical treatment for Cauliflower Ears is much more difficult and frustrating. The organized hematoma is the consistency of cement, the skin is scarred down to it and the cartilage beneath the hematoma often disintegrates from the pressure. This is what happened in the case pictured above. Fortunately, despite the trauma, he did not suffer hearing loss. Often, the swelling fills the ear hole, obstructing the external auditory meatus (ear hole) essentially forming an ear plug. You may have noticed that the ear opening in the after photo is three times larger. 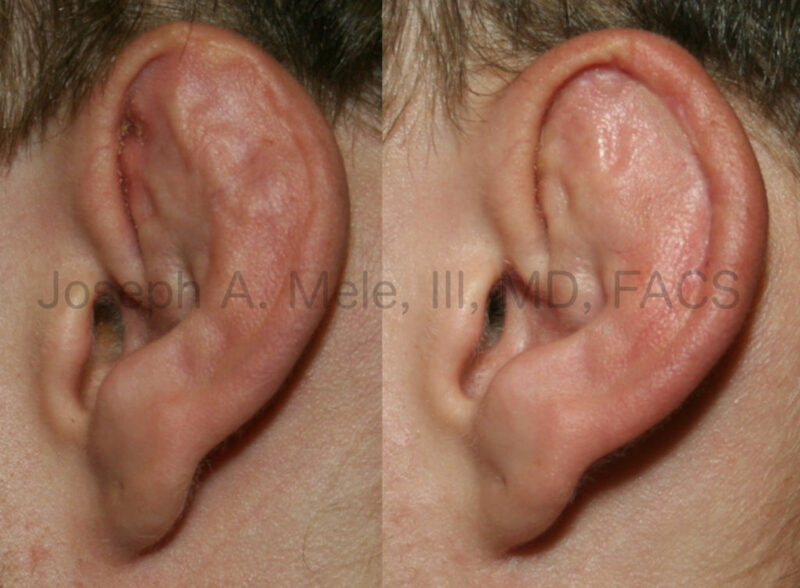 In the before pictures, the interior curves of the ear are completely obscured. The skin is super-glued down to the old hematoma, making further injury more likely. Most of the cartilage of the upper ear was dissolved by the injury, so the helical rim, the curved edge of the ear, had to be reconstructed with skin, without the benefit of normal cartilaginous support. After reconstruction, the hollow of the ear is restored. The helix is clearly defined, and the ear hole is opened to its normal dimensions. The skin covering the ear is thicker than normal due to scarring from the injury, so the subtle folds of the antihelical fold and other ear curves are muted. Here, the ear hole, otherwise known as the external auditory meatus, is closed. Cauliflower ear treatment often includes opening an obstructed ear hole, in addition to restoring the normal ear hollow and curves. Sometimes the cauliflower deformity is not isolated to the outer helix of the ear. There are times when the mass extends into the external auditory meatus (the ear hole). When the cauliflower ear deformity extends this far into the ear, it plugs the ear. In fact, it is like having permanent ear plugs. In the above case, scar tissue was removed from inside the external auditory meatus. The changes above are most noticeable at the helical rim and above the ear lobe, with the restoration of the intertragal notch. If you or someone you know has a Cauliflower Ear Deformity, call (925) 943-6353 and schedule a private consultation appointment. The pros and cons of Cauliflower Ear Correction will be thoroughly discussed and a treatment plan developed based on your specific needs.